J'adore L'Or is an Oriental Floral. The floral bouquet of J'adore is enhanced by exceptional flowers and warmed by oriental notes. Top Note - Rose de Mai Absolute: The material extracted from Rose Centifolio, "the hundred-petal rose," is used to produce an absolute. Rose Centifolia is delicate, powerful and utterly unique. Blossoms are hand-picked from the flowers grown exclusively for Maison Dior at the Domaine de Manon, an estate in Grasse in the south of France, according to traditional methods. Heart Note - Jasmin de Grasse Absolute: Jasmine symbolizes a woman's sweetness, and it is one of the most frequently used flowers in perfumery. The particular delicate and sensual Grasse Jasmine enhances the fragrance with its subtle green notes. Blossoms are hand-picked from the flowers grown exclusively for Maison Dior at the Domaine de Manon, an estate in Grasse in the south of France, according to traditional methods. Base Note - Tahitian Vanilla Absolute: The white Vanilla flowers produce a fruit that takes 8 or 9 months to mature. The pods are harvested just before they ripen, then undergo a 34-month maturation process during which their perfume develops and Vanilla crystals appear. The Vanilla then reveals its sweet and spicy accord which blossoms in the base nore of J'adore L'Or. At the heart of J'adore L'Or's floral bouquet is Rose de Mai Absolute and Jasmine from Grasse Absolute. This highly concentrated Essence de Parfum reveals a divine element of surprise in the opulent notes of smooth sweet Tonka Bean Absolute, and tender sensual Tahitian Vanilla Absolute. This daring creation is heightened by Patchouli, and few drops of Labdanum and notes of amber. 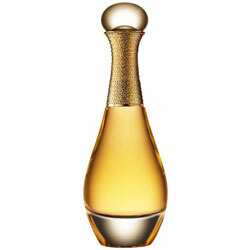 Oriental in style, J'adore L'Or is an exceptional essence which blossoms lavishly. Fodor, Ashley. "It List." Elle Jan. 2011: 106.